The Vacuum Cleaner is an ubiquitous piece of equipment in any home. Given the right care, it lasts for a long time. A typical dry type Vacuum Cleaner has few parts to go wrong other than its motor. And the motors in them are not subjected to overloads as are other motors doing duty elsewhere. Here in this page, we present actionable tips on the maintenance of the Vacuum Cleaners. Store the attachments in its box. Many of the attachments are made of brittle plastic and can break. Vacuum cleaner hoses work under extreme conditions. Don't haul the weight of the cleaners using only the hose. Again don't pull the unit by its mains cable. In general vacuum cleaners need to have their bags changed or their dirt containers emptied. Failure to clear out the dust bags will result in poor suction. Poor suction translates to longer working hours and higher temperatures. Most bagless and some bagged vacuum cleaners have filters that need to be cleaned or replaced every month or once in few months. One of the most common maintenance jobs for vacuum cleaners is replacing the belt. One can replace the belt with the aid of a simple screwdriver. Another common maintenance job in vacuum cleaners is replacing the filter bag. One needs to clean out the filter underneath the bag before replacing. To access the filter beneath the bag, simply pull out the filter bag out of the vacuum cleaner first and then the filter out. Wash it with soap and water and dry it before positioning it back in the vacuum cleaner. If the host attachment to the vacuum cleaner becomes clogged, one can clean it by pulling it straight and poking a broom handle through it. 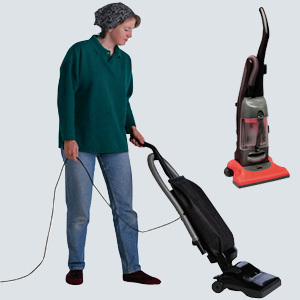 Vacuum cleaner cords need to be examined seasonally to make sure that no fraying wires are evident. The rollers or castors of the vacuum cleaner need to have hair and fibers cleaned from the surface regularly. If the Vacuum cleaner refuses to run, first check for frayed wires feeding it. If you have a VOM (Volt Ohm Meter) - a simple digital multimeter set to continuity tester mode when connected across the mains plug of the unit will tell you if the motor, wires and the switch are normal when it shows a reading of 20 Ohms or less. If there is no continuity, a good place to start is the switch on the body of the cleaner. Mechanical switches are prone to failure after a few thousand operations. Replace as required. Some motors may have a thermal fuse on its body. Most manufacturers attach a sheet of the circuit diagram on its inner panel. Look for a thermal fuse if there is no continuity in the motor's terminals. Typically a Vacuum cleaner intended for home and car will have about 1000 or 1250 W motor with about 12-15 liters dry capacity and if wet type, it may have about 14-18 liters capacity. They may have a noise rating of 80-85 dB. Most Vacuum cleaners use high speed universal motors which can rotate at several thousand rpm (rotation per minute). They use carbon brushes which require periodic replacements. This is a job best left for the qualified service technician. Do not disassemble the motor section of the unit under any circumstances unless you know what you are doing. Inspect the service ports and hose on a regular basis for any obstruction. There are pop up pins used in some machines, which indicate the time to change the filter but these pins are not always reliable. Test to see if the filter is plugged: First clean the main dirt canister and then the filter and turn on the vacuum cleaner. If you notice an increase in the suction power at the end of the hose, then the filter needs to be replaced. It is advised to do this test on a dry day so that the expelled dust will not be a problem. As we have mentioned in this series of articles on home maintenance, a lay user can only attend to general maintenance with limited skills and tools. All electrical and electronic machines operate at lethal voltages and can CAUSE serious damage or shock hazard to self and home. It is positively dangerous to even attempt to repair any electrical machines without the required skills or knowledge. Always refer servicing to qualified technicians or the dealer.